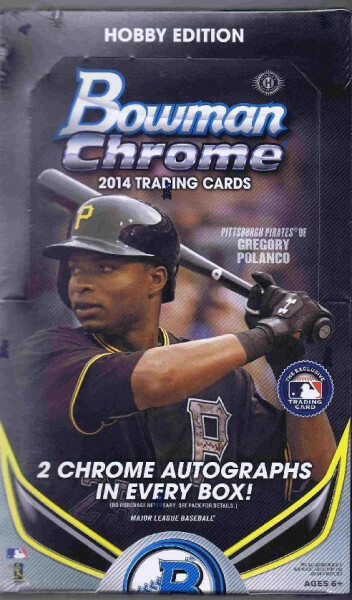 2014 Bowman Chrome Baseball Hobby Box mit 18 Packs Per Box, 4 Cards Per Pack. 2 Autogramme per Box !!! Produktinformationen "2014 Bowman Chrome Baseball Hobby Box MLB"
2014 Bowman Chrome Baseball Hobby Box mit 18 Packs Per Box, 4 Cards Per Pack. - Carbon Fiber Refractor #'d to 10. NEW! - Superfractor #'d 1 of 1. - Autographed Printing Plates #'d 1 of 1. - Superfractor DIE-CUT Parallel: #'d 1/1. NEW! - Orange #'d to 25. - Printing Plates #'d 1/1. Weiterführende Links zu "2014 Bowman Chrome Baseball Hobby Box MLB"
Fanbewertungen für "2014 Bowman Chrome Baseball Hobby Box MLB"